Katie Clark is a full-time freelance artist, focusing on mashups of pop culture and renowned art pieces. Katie grew up on a farm in Virginia, in love with both art and video games. She decided to pursue a life combining both of these loves, and moved to the Seattle area to attend DigiPen in 2003. After earning a degree in Computer Animation and graduating as the school's first ever female valedictorian, she worked at Nintendo for 6 years as an artist. She is credited on games and apps in some of her favorite franchises: Mario, Metroid, Animal Crossing, Kirby and Donkey Kong to name a few! Now she has returned to her original love: traditional art. Katie honors the characters that bring back happy childhood memories, and celebrates the new games that take over her life. 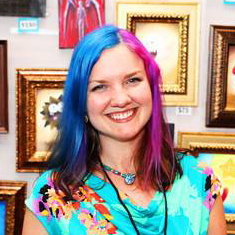 She brings her work to comicons and conventions in the Pacific Northwest, and her paintings are hanging all around the world!